What with that big in-or-out vote coming up next week, that oik Boris Johnson was clowning around only this morning in Coffeelink on ye olde Ipswiche waterfront. We're only a couple of hundred meters away, far enough, around the corner from dependable Bella Napoli. Don't tell mummy but Something Yummy has ceased to be, at least on Pownall Road. 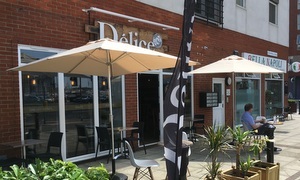 At number 20 you'll now find Delice. Their Facebook page says they do "freshly prepared pizza, pasta and hot warps [sic]". Beam me up! Tables sit outside with big parasols -- easy to confuse Ipswich with Monte Carlo when the sun's out -- and that's some classy lettering. Seems like quality inside, too, and there's folk inside and out. Panini meal deal for Andy, briefly extricated from his VIP project, and a falafel wrap/warp for me, a bountiful bargain at £3.49. Add a bag of bacon and maple syrup kettle chips, a bottle of Juicy Water and some sunshine and you're living. Regular flow of people coming and going points to the fact that they're doing it right. Lots of smiles, too, from the Delice team. Didn't spot anyone ordering the shisha pipe. Save that for another time. That handy parking spot outside Tesco won't last forever, so best we take away a pair of lattes and a slab of vg flapjack. Pleased with Delice. If it was a car -- DeLorean. If they were passing by -- Mutya Buena.